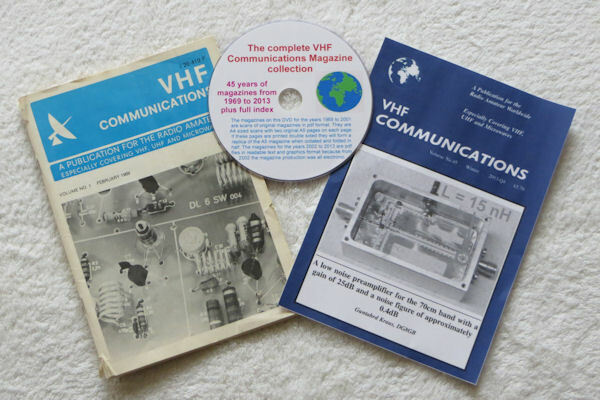 VHF Communications was a quarterly magazine published between 1969 and 2013 especially for radio amateurs and professional RF engineers. It covered the VHF, UHF and Microwave bands. The magazine started as the English version of the German magazine UKW Berichte. Over the 45 years of publication it covered many topics from valve equipment through transistorised equipment to RF Integrated Circuits. The designs were published with full circuit diagrams and printed circuit layouts. Many theoretical topics were covered such as; antenna design, oscillator design, transmission theory and the practical use of modern RF modelling and design software. All the magazines are available as back issues or on DVD/CD and a full magazine index is available to download to locate any articles of interest. Some sample articles can be downloaded as pdf files. Kirk has been busy again with a new whizy OCR tool and lots of time he has re-done all 180 magazines so that not only is the text in machine readable form the pages are sequential and relevant diagrams are rotated to make it easy to scroll through the pages in your PDF reader. The 2015 version of the complete DVD now has the original scanned documents plus Kirk’s latest versions. Anyone who has purchased the Complete DVD can contact me and I will supply them with the 2015 version for a small charge (£2.50) plus postage. Gunthard Kraus, GG8GB, was a prolific contributor to VHF Communications Magazine, there were many detailed design articles, often using the latest CAD software, plus the regular “Internet Treasure Trove”. He sent me a Christmas message and with it an update on the articles that he has been writing since I last published one of his articles in VHF Communications Magazine issue 4/2013. He has a web site - www.gunthard-kraus.de - where you will find all of his work in German plus a lot that has been translated into English (and Russian). I have started to translate some of his newer articles into English, ones that are not already translated. Gunthard will add the new translations to his web site and I have set up a new menu tab on this site where I will put those translations plus any VHF Communications Magazine articles that are references in those articles.